A Sequim waterfront home with beach access is hard to find, and this kind of property is also is in high demand. The vast majority of buyers who are moving to Sequim to retire and buy a home would prefer a Sequim waterfront home, and who can blame them? Who wouldn’t love to be able to walk out the back door and into the sand barefoot? Okay, maybe not barefoot, but how great would it be to be able to walk from the back deck to the sand in the morning with a hot gourmet cup of Starbucks? This Sequim waterfront home is on the beach with a view of the Strait of Juan de Fuca, the Sequim-Dungeness Lighthouse, Mount Rainier on the horizon on a clear day, and that’s just on one side of the house. Look out the dining room window on the other side of the house, and you’re looking at one of the best views of the Olympic Mountains on the entire Peninsula! I’ve located this home on this map to show you how this home is situated in a perfect location. Honestly, could this location and water view be any more perfect? From the house toward the mountains are 70 acres owned by the few homeowners on this private street, and this 70 acres can never be built on. In other words, the view to the mountains will forever be clear and protected. Try and find a Sequim waterfront home or any waterfront home on the west coast with both beachfront and an extraordinary mountain view. This really is a rare home. Learn more about this home and see the entire MLS listing data sheet at Sequim Waterfront home. There is some extraordinary Sequim high bluff property for sale, and I’ve been out showing and previewing some of these properties recently. The appeal of a Sequim high bluff property is obvious–a high water view of the Strait of Juan de Fuca or Sequim Bay or Discovery Bay. Some of these views are so extraordinary, you find yourself just standing on the bluff in awe. I showed one home on the bluff that was designed for this high bluff lot perfectly with a view from almost every room in the house. Sequim High Bluff Property Dangerous? If you fall in love with a Sequim high bluff property, your first question is likely to be something like this, “Is the bluff safe?” The issue of bluff stability and landslides will clearly be on your mind. Bluff stability is a complicated subject, but here are the relevant issues and how you as a buyer can approach this subject if you are thinking about buying a Sequim high bluff property. There are many factors that influence bluff stability, including bluff height, sediment type, slope, slope aspect, topography, vegetation, microclimate, waves, tides, sea level, drainage, surface water, ground water, weathering, earthquakes, and land use. We have bluffs that are as high as 170 feet or more above the beach. We are fortunate that some of our bluffs consist of strongly compacted soil types, the result of glacial sediment that geologists say greatly compacted and strengthened many of our bluff areas. Slope aspect refers to the direction the bluff faces. Bluffs that face the north are less subject to erosion than bluffs that face the south because of the increased freezing and thawing action. 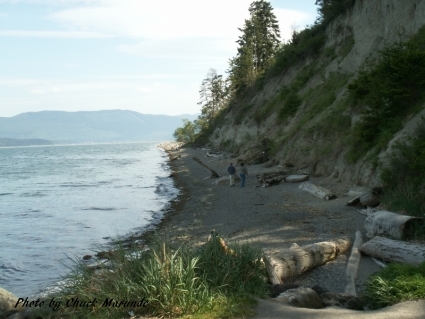 Some Sequim bluffs that are to the northwest of Sequim and outside the protection of the Dungeness Spit are exposed to substantially more wave action, tidal action, and in some areas are subject to underground run off from the Olympic Mountains. I’ve seen Sequim high bluff property that has virtually no vegetation, no trees, and no root systems for bluff stability. There are several homes along the bluff between Sequim and Port Angeles that were built long before the 100 foot setback requirement, and some of those homes have had to be moved further back as the bluff eroded over many decades. There are, in fact, miles of Sequim high bluff property that has been stable for as long as human memory serves. These are bluffs that are largely in protected Bays or protected areas along the Strait, and that have solid and well compacted sediment, do not have excessively steep slopes, have a lot of surface vegetation with deep large tree root systems, and do not have excessive underground water drainage out of the mountains. Many clients have told me that they have not seen any erosion at all on their bluffs in two and three decades. Others have said they’ve lost one or two feet. You do have the option as a buyer to have a contingency in your purchase agreement that would allow you to hire a soils and bluff geologist. There is one such expert in Clallam County. He charges about $800 for an onsite analysis and a written report. In practice, very few buyers decide to front the money for a bluff stability report. Most buyers will get a verbal opinion, and talk to the sellers and neighbors to learn the history of the bluff, and then make a decision themselves. Now you know a little more about Sequim high bluff property. 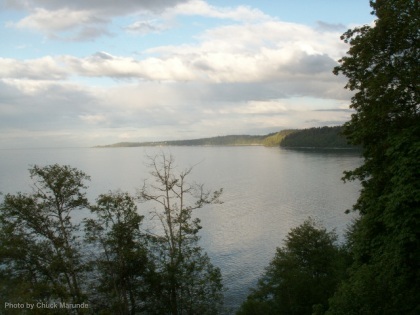 Buying Sequim waterfront property is one segment of the real estate market where a buyer can find one of the most beautiful beachfront properties, or a low or high bluff panoramic water view. This is what many retirees plan for five to ten years before finally making it happen. It will be the property of their dreams, where they intend to build their last home. It will be the fulfillment of a lifetime goal. But there is a trap for the buyer who lives outside the Sequim area. A buyer can unwittingly make a terrible mistake by paying too much for Sequim waterfront property. I’ve lived here for 18 years, and I’ve seen it happen many times, even recently. It’s one thing to pay $10,000 or even $50,000 too much, but what if you throw $100,000 or $200,000 over the bridge by paying too much? Sequim Waterfront Property – Paying Too Much? We do have properties that are overpriced. I know that’s not front page news, but we actually have buyers who paid too much, and some by a lot. And guess what? They were represented by an agent, sometimes a dual agent and sometimes their own agent acting as their buyer’s agent. But there are many traps for the unwary, and many conflicts in the real estate industry that work against the buyer. Let me give you a lifetime of experience representing real estate clients, including 20 years as a real estate attorney. I can explain to you in great detail how to avoid getting caught by this trap, how to determine the true fair market value of extraordinary water views, and how to structure your offer. Email chuckmarunde@gmail.com or call anytime, 360-775-5424. I’ll make sure you don’t throw $100,000 over the bluff when you buy your Sequim waterfront property. 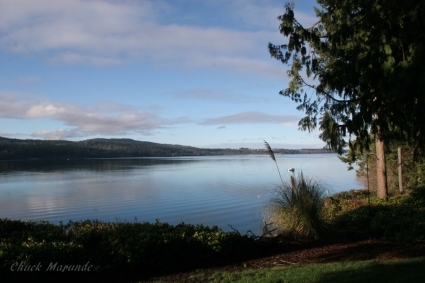 This gorgeous Sequim waterfront property is now officially available. This is not only a Sequim waterfront property, it is a Sequim beachfront property. Sequim is famous for its Rain Shadow, and this home is near the center of the Sequim Rain Shadow, located just off shore from this home. Imagine this. You walk out the back door, across the deck and down the ramp to the beach, and stroll on the beach with the Sequim-Dungeness Lighthouse in the distance, Sequim Bay and the beautiful Strait of Juan de Fuca singing quietly to your soul, and Mount Baker resting in all its glory on the horizon. Now you have a taste of what it would be like every day if you owned this home. Imagine this. 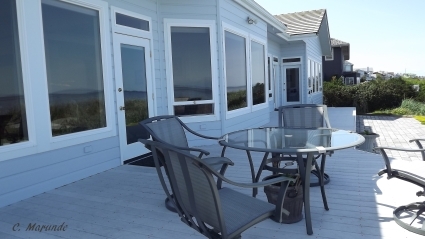 From most of the windows in this home you have a panoramic Sequim waterfront view spanning from Sequim Bay to the San Juan Islands to British Columbia. Stand in the kitchen at the stove stirring your organic vegetables, and if you look up, you have a stunning Sequim waterfront in vivid live colors. Pause while eating at the table, and you’re looking at the Dungeness Lighthouse. Turn your computer chair in your office, and you’re looking toward Mount Baker. Walk across your master bedroom, and you cannot help but stop to look at the tidelands (which you own). What is it about water that gently encourages the mind, reduces stress, and uplifts the spirit? Imagine this. You’re enjoying dinner in the formal dining room on the opposite side of the home when you look out the window to see a gorgeous mountain view. It is a rare thing to find a property with both a stunning Sequim waterfront and a majestic mountain view–both unhindered forever. The mountain side of this property includes 70 acres owned by the 12 property owners of this private development, and this 70 acres is permanently to stay in it’s undeveloped state. It is beautiful and very green. This home will not be on the market long. That’s my prediction. You can look for a property like this for the next five years, and you won’t find it. Want to learn more? Go to Sequim Waterfront Home and you’ll see more photos, detailed information, and soon a real video tour will be coming online. If you would like a copy of the special features not shown in the listing data, you can email chuckmarunde@gmail.com. 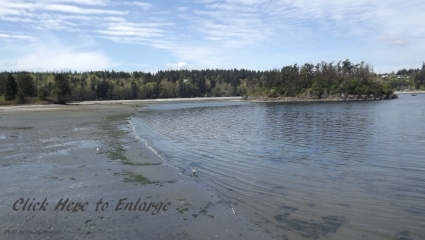 If you’re looking for a Sequim waterfront property, you may have found it. This Sequim waterfront property is brought to you by Sequim & Port Angeles Real Estate and Chuck Marunde. This Sequim waterfront property is coming on the market soon. You can actually walk out your back door and down a few stairs and be standing on the beach. You can sip coffee or tea (or wine?) on your deck and breath the fresh salt water air. If you prefer, you can stay inside and see this gorgeous view from your dining room table, from the kitchen, from the living room, and from the master bedroom. This home was built with a custom design for this location to take advantage of the water view. Not very many Sequim waterfront properties can boast the stunning views from almost every room, nor can most homes boast the quality of construction and the quality of materials used to build this home. 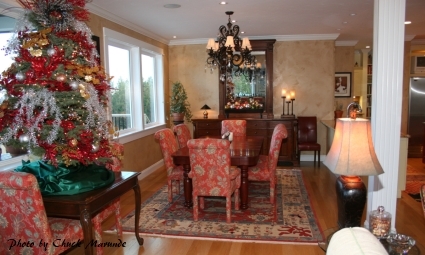 The best of the best Sequim waterfront homes do not last long once they come on the market. This home is one in a thousand. They don’t make Sequim waterfront property like this anymore, and having a beachfront home that is so close to the Sequim rain shadow is a bonus. 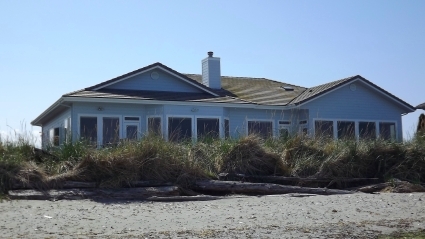 The center of the Sequim rain shadow is right off the shore of this home. Where else are you going to find a gorgeous Sequim waterfront property near the center of the Sequim rain shadow? As soon as this home is listed and officially on the market, I will post more photos and details with a link to the MLS, but if you are in the market for a luxury Sequim waterfront property, may I suggest you call me now? 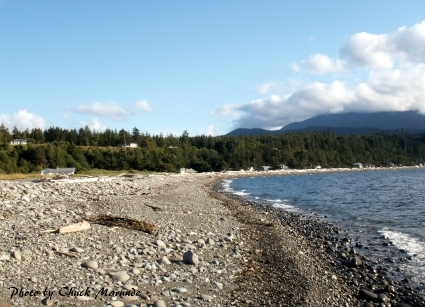 Sequim waterfront is one of the key attractions to the Sequim coastline. 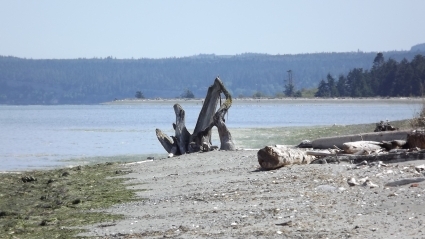 If you love incredible beaches where you can take some time for yourself and enjoy a relaxing walk with your dog, we certainly have more Sequim waterfront than you can ever walk. Walking along the beach or the Dungeness Spit at sunset is also a reminder of the beauty of nature on the Olympic Peninsula. While strolling on a vacant beach one can’t help but reflect on life and how precious every day is as the stress of work and financial concerns somehow fade when we are on the beach breathing the fresh saltwater air and feeling the gentle rhythm of the waves. You are welcome to download any of my photos on this blog to your computer and use them as screen savers. Periodically, you will see right on a photo that you can click on it to view a larger version, and that larger version might make a nice image on your computer monitor. If you’re in California or Arizona or Texas, a beautiful photo of Sequim waterfront property is a sweet remind of what you have to look forward to when you move here. No wonder so many retirees want to buy a home with Sequim waterfront property or a Sequim water view. 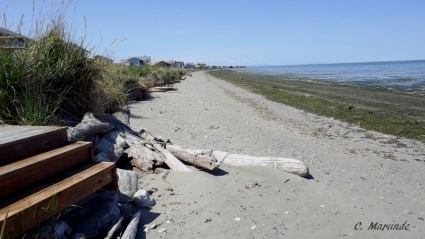 Wherever you will live in Sequim, it is never a long drive to a peaceful walk on Sequim waterfront beaches. You can look at some of our finest Sequim waterfront and water view homes right now. Here’s is a list of the homes in the Northwest MLS in Sequim with water views: Sequim Waterfront and Sequim Water View Homes. This Sequim water view home may have the ultimate luxury kitchen in Sequim. It is beautiful, and that may be obvious, but it has more features built into this kitchen than meets the eye. In this article, the owner and designer describes what she had in mind when this extraordinary kitchen was but a twinkle in her eye. I’ll let Donna tell her own story of how this Sequim water view home with this luxury kitchen came to be. Then you’ll want to see the special video with the guided tour by the owners themselves. When we moved to Sequim, my husband Jerry, knowing my love for cooking, said to me, “Put in all the bells and whistles now, because this may be your last chance to have your dream kitchen.” Of course, that was like turning a child loose in a candy store. I started by writing down all the things I would like to have in my new kitchen. First, I wanted functionality and a beautiful kitchen. We have an open floor plan, so the kitchen needed to present itself well and be well integrated into the rest of the home. I have seen many beautiful kitchens which are not functional and poorly designed. With the money that would go into this kitchen, I wanted to make sure the investment was worth it. 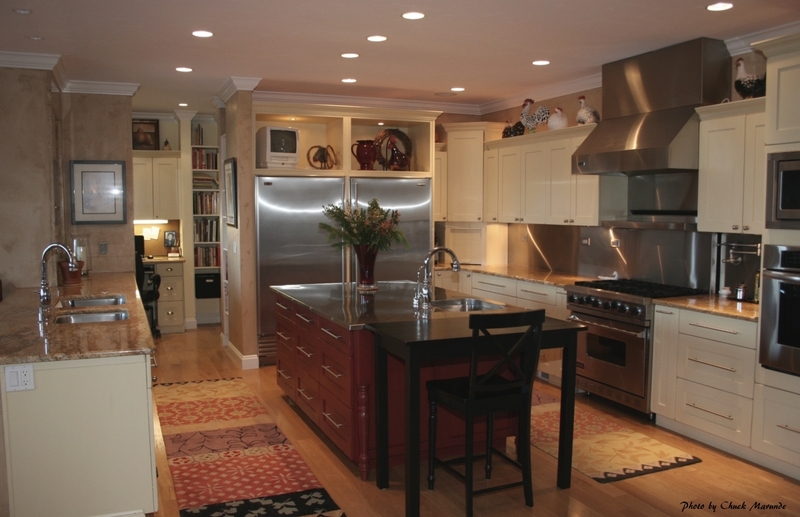 For my style of cooking, I divided the kitchen space into 3 zones which are separated by a center island. Zone 1 is for clean up, Zone 2 for preparation, and Zone 3 is the center island which can be used for additional preparation and serving, and we often use it as a buffet. Should you be lucky and have a husband like mine, he will help with clean up, stacking dishes into a commercial Hobart dishwasher in Zone 1, while you’ll be happily preparing and cooking in Zone 2, which means you stay out of each others way! Oh, did I say Hobart dishwasher? Yes, a 90 second dishwasher. That’s 90 seconds, not 90 minutes for one load to complete like most residential dishwashers. The walk area around the center island is 40″ wide, allowing easy mobility. All lighting is well placed with dimmers, making cooking and spending time in this space relaxing, and with no glaring lights, no squinting, and no tired eyes. 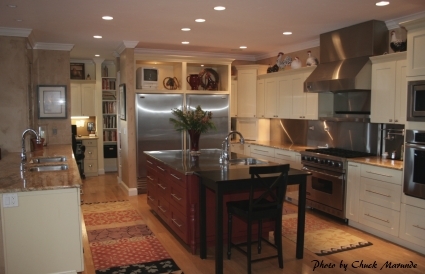 My goal was to have a commercial like kitchen, but with soft edges, which comes from the cabinets and color choices. 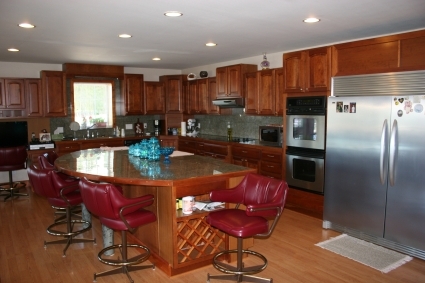 Napa Valley Color Selection by Hertco Cabinets was the color of choice for the cabinets with granite counter tops. Fully extended drawers are a must. I have never had FED, and thought they would not work as well as cabinets. WRONG! Having them has made my life in the kitchen so enjoyable, no more bending, or getting on the floor for that one platter in the back of the cabinet. As previously mentioned the floor plan is quite open which means the kitchen in some ways becomes a part of the great room and must look as though it belongs. Even if you are not a cooking enthusiast, a well planned kitchen can bring joy to you and your home. Friends and family will love to visit and will feel comfortable in this space. The downside is they may not want to go home, but we do love entertaining. Thank you Donna for sharing your kitchen and your passion to create the ultimate Sequim kitchen. For those who would like to watch the guided video tour of this beautiful Sequim water view home, go to Sequim water view video tour. 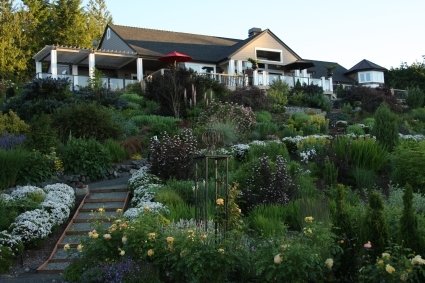 This Sequim water view home is arguably the most beautiful luxury home in Sequim. There are many elements to the ultimate luxury home. 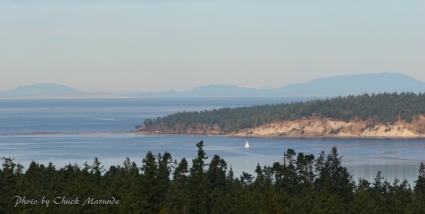 This home has the best of locations with a panoramic water view of the Strait of Juan de Fuca, a prestigious gated community, and a five acre lot with the home majestically poised on the highest view point. The property has been beautifully landscaped, but the landscaping can be maximized or minimized to suit your preferences. The architecture and floor plan of this home truly set it apart from all the other homes in the MLS. The design focused not just on beauty and comfort, but also on functionality. 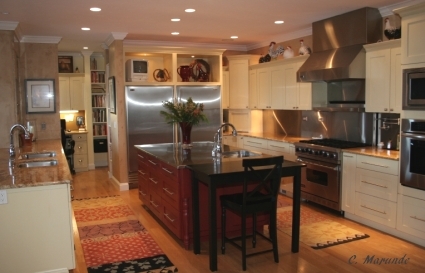 The kitchen is full of special features that are rarely found in any home, even a luxury home. The site planning of this home takes advantage of the water view, and all this together definitely make this home one of the most, if not the most, beautiful luxury homes in Sequim. Take this unique video tour in which the owners themselves talk about the design and features and walk us through the home. 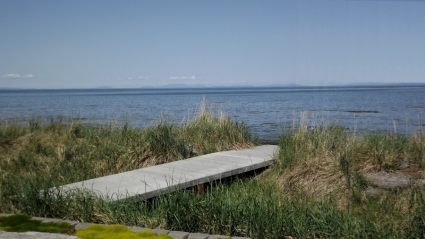 You can learn more about this stunning Sequim water view home at Sequim MLS listing. These owners also love to golf, and Sequim Golf Courses are some of the best in Washington state. Sequim has the driest golf courses in Western Washington. Learn more about our golfing at Sequim Golf Courses. For a private showing of this $1.1 million dollar home, please call Chuck Marunde at 360-775-5424 or email chuckmarunde@gmail.com. Come and see Sequim, which has been called “One of the 10 Best Places to Retire in America.” And come and see this incredible Sequim water view home. A Sequim water view home is coming up for sale, and you’ll find it right here. This is no ordinary home. This home is an extraordinary custom home with a stunning Sequim water view of Sequim Bay. Here is a preview. This water view is from the deck of the house looking to the north, and since this home was designed with windows taking advantage of the water view, this view is also seen through many windows from the kitchen to dining room to den to master bedroom. I will input this listing after Christmas and come back here to post an updated link to the full MLS data with more photos. After that I will also be posting a video tour. Waterfront property and beachfront property as shown in this photo of Freshwater Bay is available on the Olympic Peninsula east of Sequim all the way west of Port Angeles, but I know from my own clients’ experiences that you have to search for the needle in the haystack to find the perfect property with the view you want within your price range. If you’re searching for waterfront property or waterview property, I hope you’ll consider me as your buyer’s agent. You can learn more about me at Sequim Buyer’s Agent. There is a lot of waterview and waterfront property available in the Sequim area. This beautiful Sequim water view home is elevated above Sequim Bay east of town with a feeling of privacy and acreage like a small park. I thoroughly enjoyed walking this property and viewing the inside of this home with the owners today, and I will post it as a brand new listing tomorrow in the MLS. I’ve been showing Sequim water view homes to buyers coming to town over the last several months (yes buyers are looking at homes in the winter months), and many of the homes we have looked at have beautiful kitchens, but this kitchen is one of the best of Sequim kitchens. The double aluminum refrigerator is just flat gorgeous, but the island in the middle of the kitchen is definitely the centerpiece of this model kitchen. This home is actually two stories with a third floor loft, although the main floor has everything for living, including a master bedroom. It has a total of 5,900 square feet on almost 3 acres. This house is listed at $799,000. Just behind this property and a little higher in elevation are two lost, each a little over 2.5 acres, an ideal site for a tremendous Sequim water view. These two lost are listed at $299,000. See more photos and details on this home at 2084 Old Gardiner Road, a beautiful Sequim water view home. 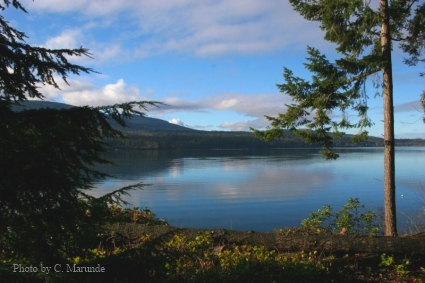 Sequim waterfront property is in demand, and we do have some beautiful Sequim waterfront views. From east of Sequim to west of Port Angeles are beachfront, low and medium and high bluff, and panoramic water views from the mountains. Waterfront properties that would be one to three million dollars in California or on the Seattle waterfront may only be $200,000 to $500,000 here. But we are also away from the hustle and bustle of the I-5 corridor. Sequim is known as a Rain Shadow and as a retirement paradise. This Sequim waterfront video is a vignette of the water views here, and I hope you enjoy the video and photos. I enjoyed taking these photos and videos over a period of several years. One of the challenges buyers have when they are searching for waterfront property is that Realtors do not enter their listings with the same standards, and the Sequim MLS is not programmed for precise searching of similar water views. Let me explain this. When a Realtor enters a listing with a water view in the MLS, he or she has a couple of options when choosing parameters. The MLS gives us the ability to select from two major categories. Under the category “waterfront” are these choices: lake, none, pond, river, salt water, and stream. Under the category “views” we have “salt water” and “salt water and mountains.” If you search for “salt water” property, listings will not show up if they have been marked by the listing agent only as “sale water and mountains.” In addition, Realtors can select multiple combinations. This can make comparisons almost impossible for someone searching the online MLS from out of state. This is a fundamental programming glitch or shortcoming in the MLS in my opinion. 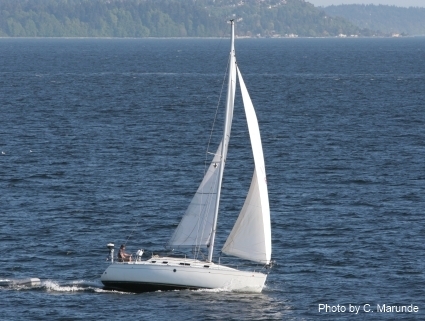 In addition to these multiple possibilities, Realtors define water views differently. What I would consider a “peek-a-boo” water view might show up on another Realtor’s listing as a “salt water view.” No two water views are the same, but the way listings are entered is not always the same either. Between the different MLS parameters and the different ways Realtors choose to enter a listing, you can imagine that it is very hard, if not impossible, to do an accurate comparison of water views by searching the Sequim MLS online. One thing I do for clients is go take photos and sometimes videos of a water view so they can really narrow their search down before they arrive. I hope you enjoy my Sequim waterfront video. Sequim waterfront property with a panoramic salt water view is not as easy to find as one might think. We do live on the Olympic Peninsula, so one might think that Sequim waterfront is everywhere, and it is, but very few gorgeous medium bluff properties with a beautiful custom designed home are available for buyers. This is a brand new listing on East Sequim Bay, and it is so impressive, I knew I had to share this photo and video of this Sequim waterfront home. This home has one of the most stunning designs and floor plans of any home in the area. It was designed and built by a the owner’s son who was a master custom home builder in California. I will include a link to all the features in this home in the coming days as we get this home in the MLS and begin to promote it. This property has a medium bluff, which has an inestimable value for its next owner. There is a danger in some high bluff properties. Let me explain, so you will know how valuable this medium bluff property really is. We have high bluff properties from east of Sequim to far west of Port Angeles, but some of these high bluff properties are 100 feet or more above a very steep bank. Now these bluffs are beautiful, but bluff stability is no small matter. I’ve talked with many homeowners on high bluff property, and one elderly woman said she had lived in her home on a high bluff (over 100 feet) for 30 years, and she had never lost any of the bluff in all that time. But we all realize that one could lose some portion or a little of a steep bluff at some point, so a stable and medium bluff is really the ideal property. This beautiful custom designed home is a Sequim waterfront home on a medium bluff approximately 30 feet above the water. And the bluff is not steep and has a lot of vegetation growing on it, which obviously increases bluff stability with all the roots. In addition there are some trees on the bluff and this bluff is probably one of the most stable on the entire Sequim Bay. But the view is stunning from the back yard and the deck of this home. I’ll post more details with a link to the full data sheet on this home, so check back here soon. The listing price is $725,000. Update: This home was subsequently listed with two more brokers before finally getting an offer. It was last listed at $650,000, and is now pending. We won’t know the final sales price until the deed is recorded. See more at Sequim waterfront property and Sequim water view paroperties. Good Sequim waterfront reasonably priced is not easy to find. Sequim Bay water view property is hard to find. It is rare that a homeowner sells a home right on the water, whether it is beach frontage or high bluff property. 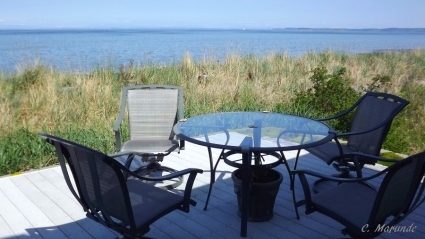 One of the premium Sequim Bay water view areas is undoubtedly East Sequim Bay, and this home has a stunning panoramic water view with a bluff that is roughly 30 feet above water. This is one of the most beautiful homes in the entire Sequim area, and since so many of my buyer clients want a Sequim Bay water view, it is likely this home will sell fairly quickly. Many people think that homes don’t sell in these “slow winter months,” but they do, just not as many. I sold a home last weekend, and I have two qualified buyers coming to look at homes in December. This home is 2,700 square feet, 3 bedrooms and 3 baths with a stone fireplace and window frontage that takes full advantage of the Sequim Bay water view. There are two master suites on the first floor and a three car garage. It was built by a custom home builder who built this home for his mother and father, and you can be sure he built with attention to quality design and construction. This is a new listing and I’ll have more photos and a real video tour up soon. There are not many homes like this anywhere on the water front on the Olympic Peninsula. 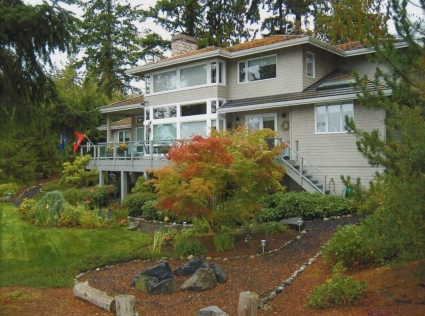 This Sequim Bay water view home is worth looking if you love a great water view. 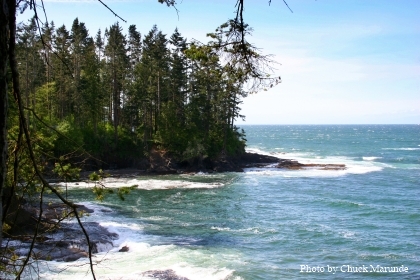 Sequim water view lots are one of our chief attractions on the Olympic Peninsula. 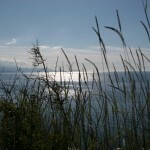 We are surrounded by water, but that doesn’t mean Sequim water view lots are a dime a dozen. They aren’t. 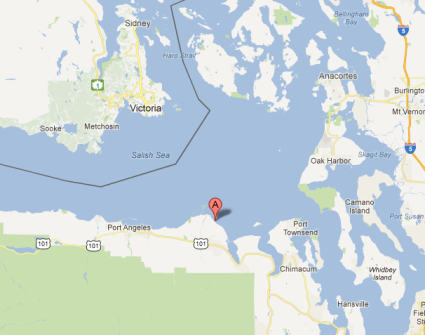 But we do have some stunning water views of the Strait of Juan de Fuca. 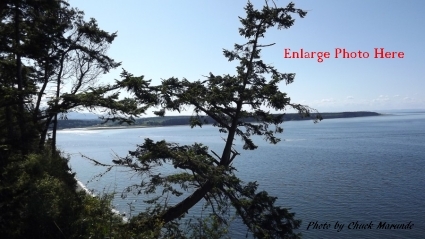 We have incredible water view lots, and some high bluff water view lots from east of Sequim to the west of Port Angeles. Today a client called from Alaska to ask about a high bluff water view lot. This lot happened to be west of Port Angeles just west of Joyce. This client asked if I would walk the lot for him. This is something I offer to do for my clients, and since he is in Alaska, he can’t jump on a plane to see one lot that may not be what he is looking for. Here’s what happened. I told my client I would go walk the lot right away, and call him from the lot. He loved that idea. I drove from Sequim to this lot west of Joyce, a 45 minute drive. I located the lot and got my client on the phone. I said, “Okay, I’m your eyes and boots on the ground. What would you like to know?” I described the property, it’s location and distance from Port Angeles, the water view and bluff stability, the neighborhood, the rainfall in that area, the driveway and the driving time from Port Angeles. We talked about the clearing and excavation that would be needed to prepare for a site plan for their retirement home, the utilities, the well and septic, and the approximate costs of all these things. This is the kind of conversation I like to have with clients, where I help them with valuable real-time information about Port Angeles or Sequim water view lots. We already had talked about the cost of construction per square foot to build a home in this area, so this Alaska client became pretty familiar with what this lot looked like and what it would take to build a home. I don’t know how many other Realtors act as your eyes and boots on the ground, whether you are looking at Port Angeles or Sequim water view lots or buying an existing home, but I love doing this for clients, and they tell me it is immensely helpful. If you need a better feel for the property than you can grasp from the online MLS photos and virtual tour, just give me a call or shoot me an email. Come and see our Sequim water view lots. Port Angeles water view property on the Olympic Peninsula is abundant, but not necessarily easy to find. Most who own beautiful water view property do not want to sell. The turnover is low. This is true of Sequim water view property, too. I stood on the beach of a gorgeous property yesterday with an incredible water view. The sounds of the waves rhythmically crashed onto the beach as I inhaled that familiar smell of the sea, and my eyes completed the experience as I looked down the beach at the old sun-bleached logs that now lay in a twisted and apparent chaotic pile. After a therapeutic pause, I realized this isn’t chaos, but nature’s ultimate order of harsh beauty. There is definitely something about the sounds and smells (and the sight) of the ocean that is soothing to the soul. As I stood on the beach of this Port Angeles property and talked with the owner, I thought about how many people from the Seattle metro area and California, Nevada, and Arizona would kill to own a water front property like this. This particular property still has the original 1931 house, which was built at a time when the area was considered way out in the country. In 1957 it was purchased by a gentlemen who also purchased the adjacent lot. He later sold it at his cost to his brother who finished raising his children there. Imagine growing up as a child on a beach front property, building forts on the shore with sticks and logs, and being able to surf and fish right from your front yard. Father and son added some bedrooms in the 1960s. The concrete sidewalk still bears the hand print of the son (now an adult heir to this property). This property is full of family memories. This is the kind of property that retirees would love to call home, not so much the old house, but the property and location itself where a new retirement home could be built. This is the kind of property that dreams are made of. The owner asked if I would consider listing and marketing this property. Of course, my answer is that I would love to, but my reasoning goes deeper than earning a commission. To handle this property would mean passing on generations of fond memories to a new family who would begin to build their memories on one of the most stunning beach front locations in the world. This would be a rewarding assignment. Water views in Sequim and Port Angeles are one of the great attractions for retirees, and we probably have more homes and land with water views than almost anywhere. Of course, being on a peninsula does help our cause. Because a water view is so important to most homeowners when they purchase their home or their lot, you will often find a view easement in the CC&Rs (Covenants, Conditions, and Restrictions). There are many kinds of easements. There are driveway easements, well maintenance easements, water line easements, trail easements, utility easements, septic easements, and view easements. A view easement is intended to protect a homeowner’s view, whether that view is of the Strait of Juan de Fuca, the Olympic Mountains, or a valley of fields. A water view may be absolutely beautiful from a vacant lot or a home, but are there trees and shrubs that will grow and hinder that view in the years to come? It’s no big deal if those trees or shrubs are on your property, since you can just trim them anytime you want. The challenge comes when those trees or shrubs are on the neighbor’s property. If the trees grow into your water view four years after you move into your new home, and you ask your neighbor to cut or trim so your view will not be hindered, will your neighbor quickly respond with a cheerful, “Yes. I’d be glad to.” Let me help you out. In 20 years of law practice I never heard of that happening. When it comes to real estate, everyone tends to become very protective. In the vast majority of cases, this kind of situation ends up in an not-so-polite discourse between neighbors who were otherwise quite friendly with each other. Lawyers are soon sending hate letters, and the two neighbors might as well set up automatic payment withdrawals from their checking accounts directly to their attorneys’ accounts. The answer to avoiding this nightmare scenario is to have a written view easement that protects your water view, or your mountain or valley view. 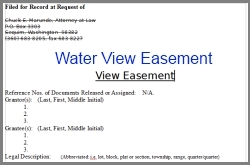 A written view easement can be a provision in the CC&Rs, or as is the case so often, there will be a separate document entitled “View Easement,” and it will be recorded. The View Easement will define exactly which property is burdened with the easement and which property is the benefited property. The language should clearly spell out what must be done and by whom, and who will bear the expense. If you have that written view easement, when it comes time to ask your neighbor politely to trim the trees, you can point out that this is a legal obligation in the covenants that run with the land. If the hair on the back of his neck goes up and he refuses, you can sue him to enforce the view easement, and most well drafted View Easements have a prevailing attorney’s fee clause. 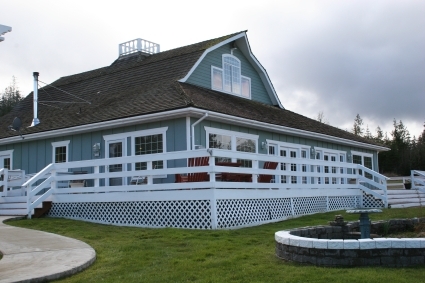 Sequim water view homes are one of the big attractions for many retirees. We have the advantage of being surrounded by water. After all, we are on a peninsula. That means we have many lots and homes with salt water views. Of course, it doesn’t mean every Sequim water view is perfect. Many homes only have a slice of a view of water. I don’t count that as a water view. In my recent showings to clients, we have looked at homes and land with a variety of water views. Some of the views are right on the beach at just above sea level. Other views are high bluff frontage, and some of these bluffs are 100 to 150 feet straight down. Beautiful, but a bit daunting when you’re standing on the precipice looking down. And then there are water views that are spectacular, because they are high in the mountains with a lofty and panoramic water view. These views are further away, but no less stunning. One of the challenges in selecting a water view is the quality of the view, which most often translates into how wide the view is. 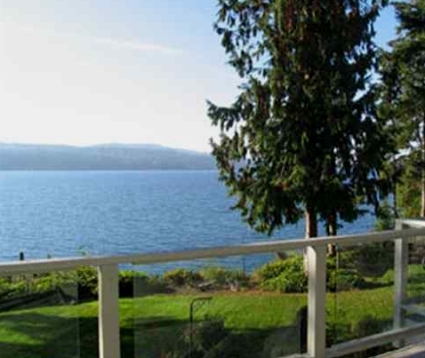 A view that is 180 degrees is extraordinary, but you certainly pay more for the ultimate Sequim water view. Other water views diminish to a narrow peekaboo view through tall trees. View my special Sequim water view map search and see if you find anything that catches your attention. If you do, email or call. If you’re from outside the area and need a better photo or video of the view from the property, I’d be delighted to do that for you. Sequim water view homes by Chuck Marunde, 360-775-5424. Sequim mountain views and Sequim water views–is it possible to get both at the same time? Yes, but it’s hard, and depending on how much of a Sequim water view and a Sequim mountain view you must have, you will pay for the quality of each. But it can be done. I showed a house yesterday with a water and mountain view, and both were spectacular. What do you pay for that in Sequim? Again it depends on the quality of each. The rule in real estate for as long as I have been in this business (30 years) is “location, location, location.” And that is the rule when it comes to a double view. That house was priced just under $800,000. How do you find this kind of perfect location, whether it is an existing home or a lot for sale where you’ll build your retirement home? I would suggest three logical and effective steps. First, search my Sequim Online MLS, which allows you to search both our local multiple listing services, and includes all the standard parameter searches as well as a convenient map, which shows the precise location of each listing. Second, after you’ve spotted some prospects, email me and let me know what you’re looking at and what your ideal property would be. Third, once we’ve communicated by email (or phone if you prefer, 360-775-5424) come to Sequim and let’s go view these properties. Consider me not just your Buyer’s Agent, but also an information gathering resource for you throughout this process long before you even get here. Sequim mountain views and Sequim water views from the same lot? Maybe. Let me help you find it. 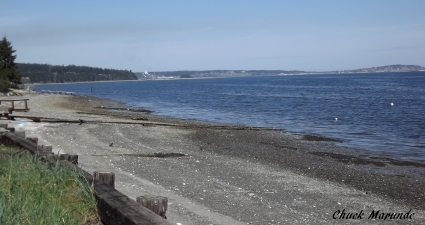 Sequim has plenty of water frontage and water view homes for sale, and so does Port Angeles.